This shows the standards specified as "apatites" or "phylosilicates". My default standard.mdb files is attached below. One can copy this file to their ProgramData\Probe Software\Probe for EPMA folder if you don't mind overwriting your own standard database (this file is never overwritten by the CalcZAF or ProbeforEPMA installer). I added a "magnification outline" feature to the PictureSnap window. In other words, if the instrument is in scan mode, the PictureSnap window will now display the imaging area on the currently displayed image as seen in the attached images below (please login to see attachments). The latest version of Probe for EPMA (and CalcImage) now load images 10-15x faster than before. Please update to version 11.9.4 and check it out. The latest version of Probe for EPMA (v. 11.9.6) has an almost complete set of pure element spectra from Penepma for 5 to 25 keV electron beams. This allows us to accurately simulate WDS spectra for the 5 to 25 keV range for teaching in the classroom without an electron microprobe for both JEOL and Cameca "demo" configurations. Anette von der Handt and I were "brainstorming" and we came up with a cool feature I think that will help with designating mapping areas on ones sample using Probe Image. By alternately clicking the corners of the mapping area one can adjust the extents to exactly cover the phase or region desired. The other thing we did which is also pretty cool is that now when one double-clicks on the full size image window in PictureSnap, the stage is of course driven to that position, but now the main PictureSnap window automatically adjusts to display the region that one clicked on. It difficult to capture an image showing this, but this automatic adjustment also occurs when using the Move To buttons in the PictureSnap calibration window. The automatic adjustment of the displayed image is especially nice when very large images (e.g., 20K x 20K pixels) are loaded in PictureSnap. Try v. 12.1.1 of PFE and let us know what you think. In further thinking about this, Anette and I thought that adding a PictureSnap button to the traverse and grid digitize dialogs would be a good idea. I needed to use PictureSnap this morning on the probe and I just have to say this automatic adjustment of the main PictureSnap window to where you moved the stage to using the "full view" window is pretty cool. Would it make sense to also automatically adjust the main PictureSnap window display based on any stage move, say the user using the joystick to move the stage? This means that those without firewall exceptions for FTP will have HTTP as the default download protocol. A small change but better. A very minor thing really, but we made some small improvements to the wavescan (and std/unk) plot displays, by making the line (and symbol) colors brighter and also thickened the line width slightly. The original default line/symbol colors in the Pro Essentials graphics library were quite muted and difficult to distinguish when plotting multiple wavescans. We also changed the colors of the current and sample off-peaks to better match other plots in PFE (where bright green shows the "current" values). We hope these changes meet with everyone's approval! We made a small tweak for the Penepma WDS simulation mode in Probe for EPMA. 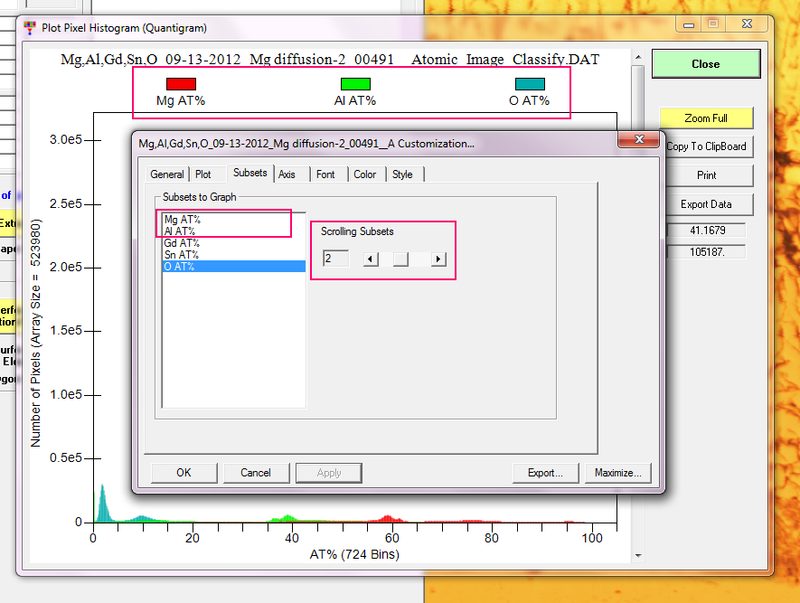 As you might remember, if you acquire a standard sample in the PFE Penepma simulation mode, the program will calculate the emission intensities for the standard composition. If you acquire an unknown or wavescan sample that has the same name (not case sensitive) as one of the standards in the run, the program will again calculate the emission intensities for that standard composition. If however you acquire an unknown or wavescan sample that has a name which does not match any standard names, the program will acquire a random composition based on the elements being acquired. I find this display information helpful when running in Penepma simulation mode and maybe you all will also. A student recently asked me if she could output her images with the data point locations shown and modify the point labels to display the actual PPM of Ti for each point. I said, not in PFE (yet! ), but it's easy to export your images into Surfer and perform a "post" operation to display one's data points with any information labeled. So what is the new feature? Well as most of you know you can set up the image overlay graphics as one prefers, from the Run | Display, Annotate and Export Analog Signal Images menu in Probe for EPMA. 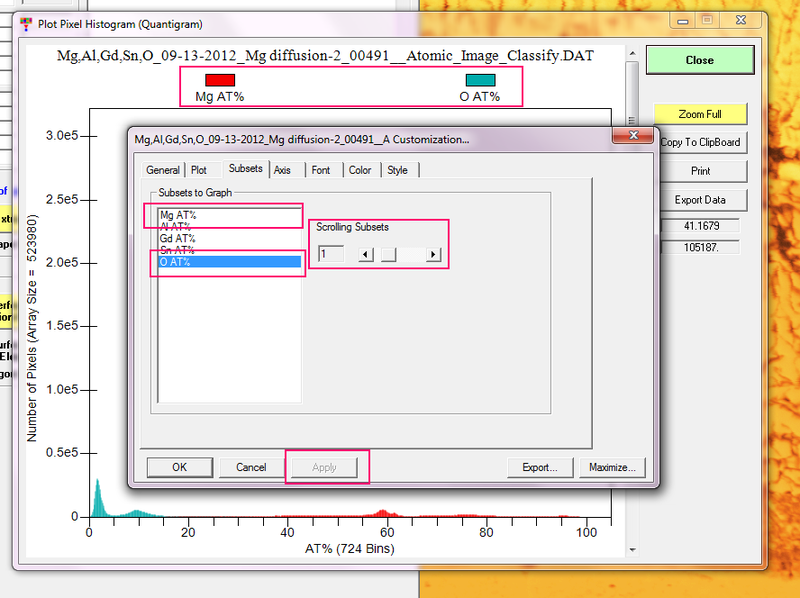 And the program will then cycle through each image and output a BMP image of graphics overlay, plus a "raw" BMP image without any graphics, plus a .DAT file with the X, Y and line numbers, and a .ACQ file with the image stage calibration information, and a txt file with the analytical conditions. Select the options you want and click OK. The program will ask if you want to run the output script in Grapher. An example of the presentation output is seen attached below (remember to login to see attachments!). Also, I should mention that this Grapher script runs much too slowly right now. We'll start optimizing it soon, but I wanted to get the feature out there for feedback and heck, automated output is always useful even if it is a little slow! Note however, that the Output | Automatic Traverse Plots menu has been moved up near the top of the Output menu. but I'm posting another tip on modifying the displayed data sets (subsets) using the Customization Dialog dialog here in the Probe for EPMA Tips & Tricks topic, because just like the above method, this works for any plot display in CalcImage or Probe for EPMA. One can also select no subsets from the subset list and then simply click the scrolling subsets control and the Apply button, and then see each new subset appear in addition to all the preceding subsets. I guess this could be useful for really complex plots? Anyway, just FYI.